The all steel construction Quick-latch Hand Truck easily converts 2 wheel vertical hand truck to 4 wheel platform. 10-Inch flat free tires help cushion the load over rough terrain. 800-Pound load capacity to move heavy loads. Wheel guards protect the load from the tires. No hitch pin to keep track of with Quick-latch system. 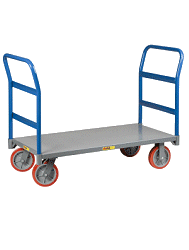 The Milwaukee Quick Latch Hand Truck is a great for home, warehouse, and making deliveries. Made proudly in the USA!